 Copyright © 2012 Dastkar Ranthambhore rights reserved. Though a mother of several children, Kallo has gotten used to the independence she has gained over time. Wanting to maintain that independence, Kallo continues working despite being one of our oldest members. While her failing eyesight keeps her from embroidering and travelling to exhibitions, she has made herself useful as a salesperson at the Kendra shop. A persuasive seller, Kallo is able to effectively interact with foreigners even though there is a language difference. Not wanting to ever be idle, Kallo likes to be busy putting things in order and looking after her compatriots' children thereby letting their parents continue with work. Originally from Khilchipur village, Shameem was among the first women to join Dastkar's Income Generation Initiative and currently holds the position of the treasurer. 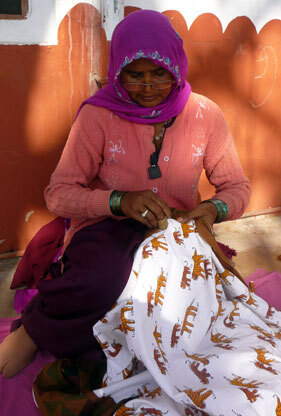 Her husband, Azeez, is a master tailor and works at Dastkar as well. 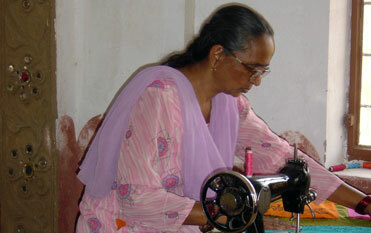 Though initially trained to do patchwork, Shameem is also an expert at tailoring using automatic sewing machines. She is a remarkably intelligent woman with an aptitude for figures. So great are her skills in this regard, that she has left management experts baffled as to how she manages to always get accurate calculations. 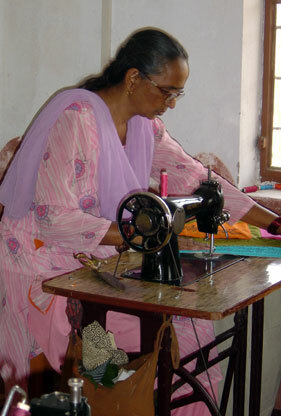 Our best worker with the highest earnings in the group, Rameshwari, currently the secretary, is trained to do patchwork but is also talented at sewing on the new automatic machines. Even though she is a widow, Rameshwari has always lived her life with dignity and has managed to independently raise and educate her children as well as settle her son in a wholesale T-shirt business. 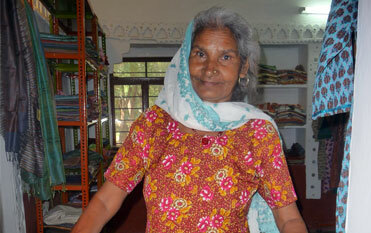 With a determined spirit, Rameshwari ventured out and represented Dastkar in a bazaar in Delhi many years ago. This opportunity encouraged others from the village to come forward. 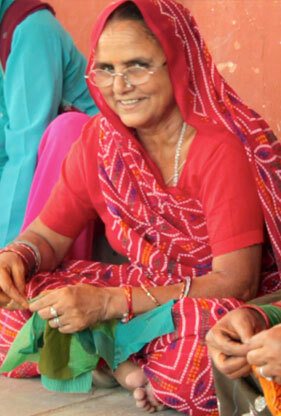 Though she came from a traditional background from the village Khilchipur, today Raeesa is on the board of Dastkar. 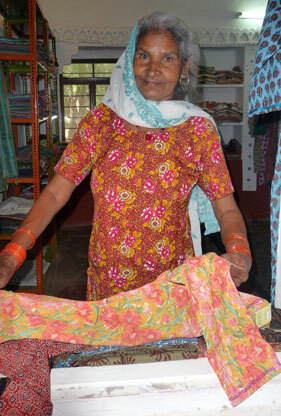 By skillfully putting patchwork together, she is now her own boss with sufficient finances to fulfill her and her children's needs and desires without depending on anyone else. By being part of Dastkar and having the opportunity to travel around for Dastkar exhibitions, she has broadened her horizons and created ambitions. With a large family of 7 daughters and a son to support, Munni and her girls are hard workers in creating recycled bird hangings to make a living. Though her husband earns by trading in goats, the income is still not enough to take care of family needs. While she regrets not having any education or planning her family, working and travelling for Dastkar has opened her eyes on how the outside world lives. 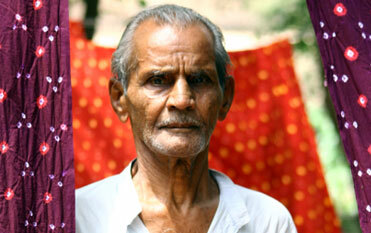 When she was deserted by her husband 11 years ago, Ruksana started living with her parents. 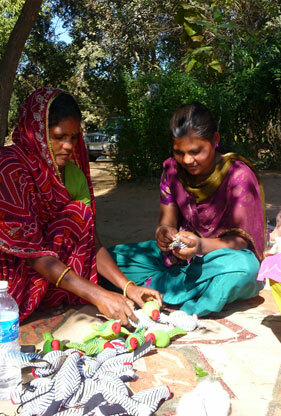 Ruksana was one of the first women who joined our new initiative in Rawal to make chindi (rag) toys. 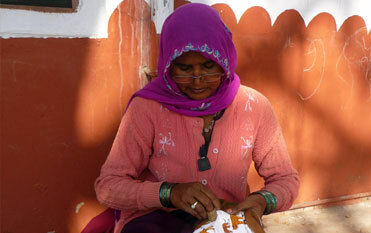 Satisfied with her earnings today, she is able to meet her household expenses and educate her daughter. Over the years, Ruksana has evolved as a confident team leader who mentors new comers while coordinating colour ways and settling work related issues within her group. A traditional regar (tanner) and mojari (footwear) maker from Kundera, Prahlad started working with Dastkar as he was keen to continue in his profession and develop something new. While many from this trade had given up, Prahalad trained under an expert to learn the technique of chattai (weaving) which he successfully uses to make a range of footwear for urban markets. 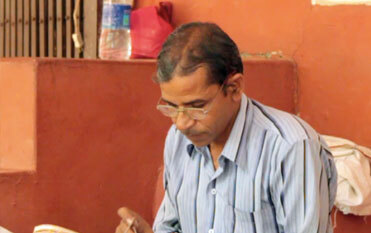 At any given time, Prahalad sells over a lakh worth of his goods at a bazaar. He has come a long way in life by gaining finances to construct a pucca (cemented) house in the village and also educate his children. When we first met Babulal in 1989, he was on the verge of giving up his trade as new synthetic fabrics adversely impacted his craft in rural and urban markets. 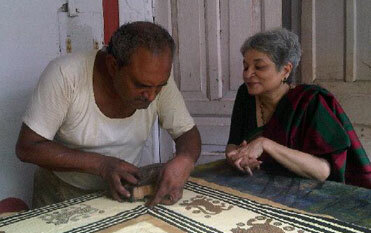 Dastkar persuaded him not to give up and revive the art Sawai Madhopur was known for. 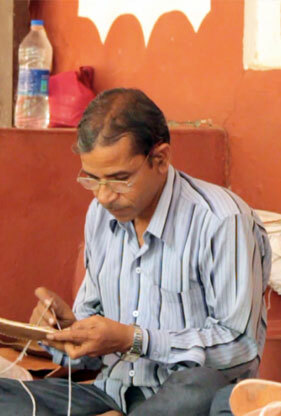 In 1990, Babulal established a printing unit at the Kendra and has not regretted his decision since. Over the years, work has increased and exports have risen due to tourists. Now, his eldest son has joined the family business to walk in his ancestor's footsteps. With two generations working side-by-side, this strong team will ensure that the craft will not diminish with time. We first met Giriraj at a crafts bazaar where he was trying hard to sell Pomchas (half sarees), traditional to the Sawai Madhopur region. 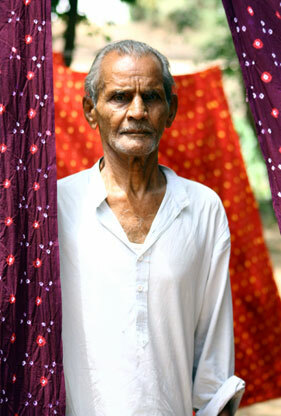 As he was unhappy with the lack of success and his pile of debt, we aided him and turned his half sarees into dupattas. By playing with colours and maintaining the region's traditional motifs (such as peacocks and flowers), we created dupattas that sold remarkably well for many years. All this benefitted Giriraj greatly as he became financially better off allowing him to repay his debts and get his children married. 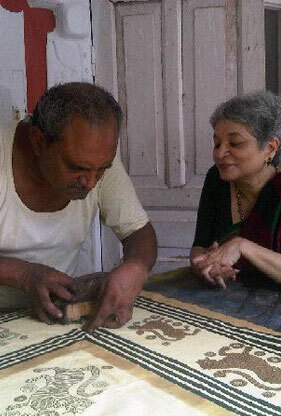 Even in his old age today, along with his wife, he continues to practice the art. 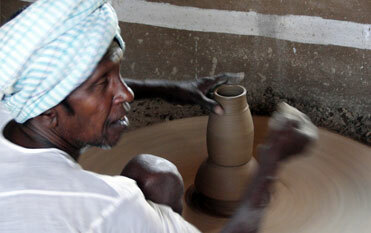 While many potters are giving up their crafts, Jairam continues with his technique of Shyamotas Prajapats (potters). He explored new forms to create a different range for the urban market instead of the pots and pans traditionally made for the local one. His father, Kakaji, encouraged him to take on the challenge and helped by providing design ideas and suggesting different embellishment techniques. 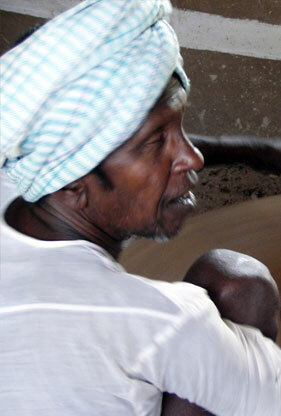 With the appreciation Jairam received for his work, he has encouraged his sons to follow in his footsteps. His son Shambu is a master at making animal menagerie and has gone a step further by developing an incredible range of bathroom accessories and tableware.